Hello everyone! 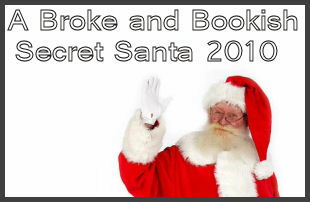 We are planning a Secret Santa exchange--broke and bookish style. We've done a Secret Santa as part of our College Students group on Goodreads so we thought it might be fun to extend it to our blog as well. We want this to be a low key and fun Secret Santa that doesn't put too much of a damper on your wallet. Please only sign up if you are truly interested and are committed to sending off a package. * Books can be new or used. Use your discretion as far as used books go. They should be in good condition. Please pick at least one other goody to put in the package. *We would love to open this up internationally and will make an effort to pair up people from the same countries to keep costs down. However, if anyone would like to do an international exchange, you can fill out that box on the form. *Sign-ups will be open until November 17th. You will be paired up and will receive your partner's info within that week. * Myself and maybe another (very trusted!) member of The Broke and the Bookish will be the only ones with access to your info. *Packages need to be sent out during the week of December 6th-10th. The earlier the better as the mail is always slow during the holiday season. * Please email me at brokeandbookish (at) gmail (dot) com when you receive your package so I can keep track of which packages have been accounted for. * Feel free to grab the button to put on your sidebar. I forgot an extremely important element to this Secret Santa. Everyone who participates is in the running to be randomly selected to get one of the books of their list. This drawing will take place sometime after Christmas. I'm not sure the exact date yet as the holidays are always busy and I never know where I'll be! Yay! I loved doing this last year and am excited to do it again! This sounds so much fun! I'm in! I LOVE this and I love the button! Yayy!! Too fun, I've signed up! Yay! I love this plan! woohoo I am totally in! I love doing secret santas! Signing up now! Connie-- I will definitely try to be pairing people up by similar reading preferences! This is such a neat idea!! I signed up :-) and adding your button to my blog. Oooh! What a great idea! Thanks for sponsoring this! I'm definitely in...(she says as she goes off to fill out the form). Megan--I think the norm would be 1..some people might send two if they are cheap but definitely not any more than that! The list of ten are really just to give a lot of options to the person buying and to show the types of book the person likes. Great idea :D Totally signed up, I'll post the button on the blog soon. So much fun! Can't wait! I'm so excited and so in!!! Thanks for hosting this. What a fun idea. I can't wait. (opps, I don't know if my first post went through) What a great idea and a wonderful way to celebrate the holidays and get to know fellow bloggers. I'm in! So excited for this! I'm in as well. Seems like fun! Are we supposed to include info on who it's from when we send it? or are we supposed to stay secret? Is there any update on this?? Did everyone receive theirs?? Emails are still rolling in on this and I'm trying to figure out if everybody has gotten theirs! It's going to take me some time. There were almost a 100 people that participated. If you haven't received yours STILL please email me.